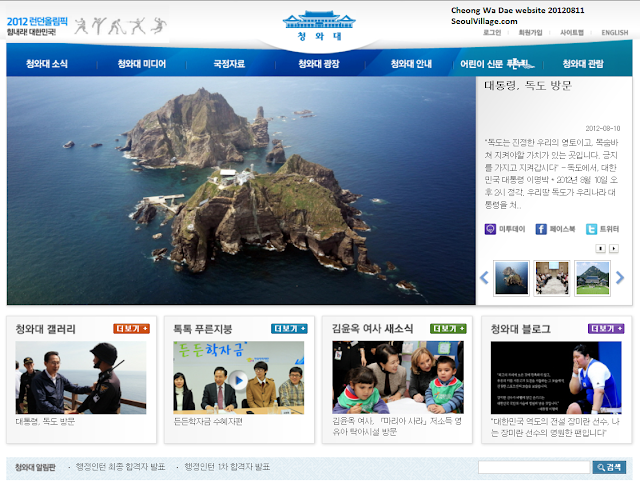 As Korea is working on shifting from the "best follower" position to the "leader" seat, the country seems to take a step backwards with LEE Myung-bak's blitz visit of Dokdo, a first for a Cheong Wa Dae boss. The event comes as a convenient diversion for a ruling party struggling with embarrassing corruption cases that ruined recent rebranding effort* and compromised PARK Geun-hye's run for LEE's seat. MB himself didn't need to boost his popularity, and he's not running for anything. But he has nothing to lose either. And thanks to this visit, the ultra conservative and ultra nationalist base somehow found a way of leveraging on the country's record harvest at the London Olympics. Picking the day of a major Japan-Korean game maximized the political impact, and Korea eventually claimed the bronze medal, as if boosted by the 'event'. Of course, the Japanese retaliated by announcing visits of ministers to the utterly controversial Yasukuni Shrine, the traditional pledge of allegiance from a government to the local extreme right. For good measure, they'll even say hello to the remains of imperial war criminals on August 15, Korea's Liberation Day.
. Visits to Yasukuni are deliberately meant to honor the worst exactions of Japan's Imperial regime, and to please the extreme right minority that destroys Japan from the inside. "Takeshima" claims are also about keeping this fascist ideal alive (see "Save Dokdo = Save Japan").
. Dokdo is Korean territory and a visit by the President is fully legitimate. It is a strong signal to reaffirm independence and the end of colonization where it all started. Such a visit would make perfect sense following for instance skirmishes between both fleets at the vicinity of the island, to the condition that the President delivered a speech resolutely embracing peace and denouncing sterile hatemongering provocations from all sides, with a clear ambition to put all the venom away. But now, and this way? I'm not criticizing the visit but the circumstances and the motives, apparently following a national(ist) agenda that shamelessly copies that of Japan's extreme right. If Mr LEE himself may not belong to the club, his government has multiplied suspicious decisions that, to say the least, have raised fundamental questions at home and abroad. Recently, it's as if Korea's extreme right pushed the whole right wing in a suicidal race, not AGAINST Japan's extreme right but IN TANDEM WITH they (and ultimately against the republican and democratic right wing). They really seem to be benchmarking this successful minority that even without public support manage to control Japanese governments to the point they cannot survive without pledging allegiance to them. Since they can't reach power democratically, they control the agenda through guerilla marketing operations with a maximum return on investment. Again**, all extremists are impostors: the worst enemies of Japan's democracy are Japanese, the worst enemies of Korea's democracy are Korean, and both need each other to survive. That's why extreme right Japanese are very happy to see Korean partners ready to play with them (the more the merrier, the same is happening with China). Fundamentally, Korea's extreme right are jealous of their Japanese and Chinese counterpart, and the government doesn't seem to be doing anything to prevent them from getting bolder as elections loom. Once more: both the Japanese people and the Korean people have the power and the duty to get rid of these enemies by exposing their impostures and by refusing the sick game of mutual hatred. And once more, make no mistake: this is not about Japan vs Korea, but about Japan v. itself and about Korea v. itself. And if we're used to sepukku provocations from the archipelago, Korean extremists have recently** proved to be very apt pupils. This year, in Korea, the real political debate should not be between right and left, but between on one side people from the right as well as from the left who defend the values of democracy and the republic, and on the other people who want to undermine the nation. As planned, I visited Seoul Museum of History yesterday for the opening day of the exhibition about 100 years of Koreans in Japan (more about that later). I didn't expect such a massive turnout but I hope, and even believe, that LEE's visit had nothing to do with it. I was glad to see more than a few Japanese visitors. And sad to see how much remains to be done for these two peaceful nations to fully love each other. And I really hope this visit won't make the pilgrimage compulsory for all Presidential hopefuls. ** I'm sincereley tired of listing each time all the posts related to these negative issues - please check the lists of posts and labels on this website. You hit the nail on the head here. It was a shameless political stunt with rallying the conservative masses behind his party. Despite the fact that LMB won't be going up for election, his party will and there's a good chance they could get trounced if the right candidate goes up against them. Already people are massing behind the 'Dokdo is Korean' banners, but there seems to be a notion that Japan won't go down wthout a fight. Japan has plenty of international diplomatic experience and the fact that they said to take it into international arbitration seems to show that they are more than confident of winning. Just because Korea has evidence doesn't mean that Japan doesn't. Still, at the end of the day it will all come down to who has the better lawyers. Thank you for sparing a minute Conor. Memory is selective, and the same can be said about the idea of justice on both sides. Koreans demand justice for Comfort Women, but the government doesn't want justice when Truth and Reconciliation is involved. Japan suggests the international court of justice but honors its own war criminals like heroes.